Autodesk Inventor Professional 2019 for Designers is a comprehensive textbook that introduces the users to Autodesk Inventor 2019, a feature-based 3D parametric solid modeling software. All environments of this solid modeling software are covered in this textbook with thorough explanation of commands, options, and their applications to create real-world products. The mechanical engineering industry examples that are used as tutorials and the related additional exercises at the end of each chapter help the users to understand the design techniques used in the industry to design a product. Additionally, the author emphasizes on the solid modeling techniques that will improve the productivity and efficiency of the users. After reading this textbook, the users will be able to create solid parts, sheet metal parts, assemblies, weldments, drawing views with bill of materials, presentation views to animate the assemblies, and apply direct modeling techniques to facilitate rapid design prototyping. Also, the users will learn the editing techniques that are essential for making a successful design. Comprehensive textbook consisting of 19 chapters organized in a pedagogical sequence. 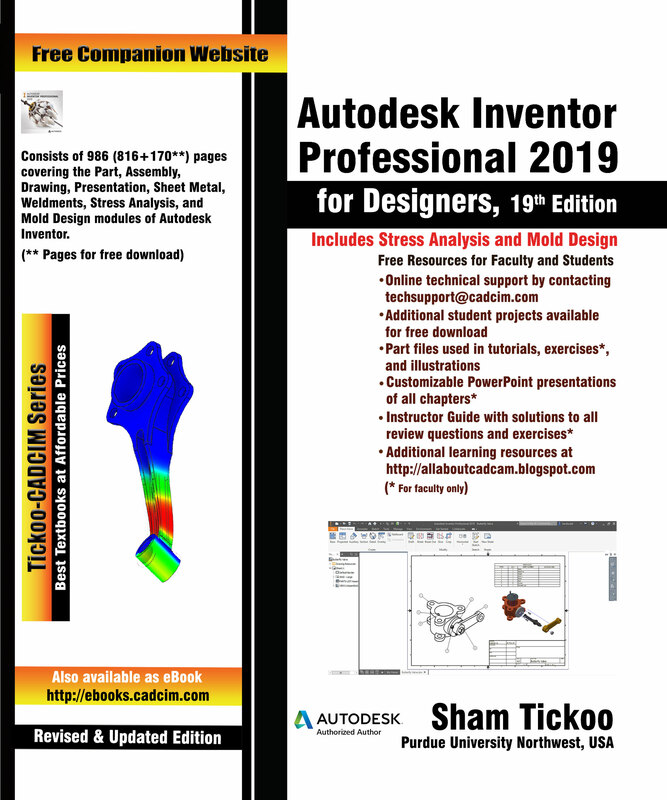 Detailed explanation of all concepts, techniques, commands, and tools of Autodesk Inventor Professional 2019. More than 54 real-world mechanical engineering designs as tutorials and projects. Self-Evaluation Test, Review Questions, and Exercises are given at the end of each chapter so that the users can assess their knowledge.